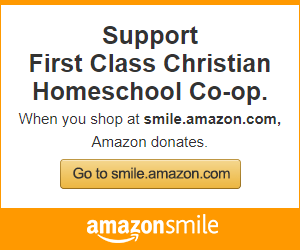 I want to let you in on a secret about writing Christian books. There’s a 100 percent guarantee that Jesus will get up in your face about the very topic you’re addressing. I wrote my first book about approval, so of course I struggled with wanting approval. I wrote my second book on happiness and then walked through an Eeyore-ish season in my life. Well, I’m no dummy. That’s why I told Jesus I wanted to write a book on the topic of beaches. This was the ultimate spiritual throwdown. I was pretty sure I had brilliantly set myself up for a challenge from God: “Go forth, therefore, and determine the quality of beach sand in Maui and compare it to the beach sand in Tahiti.” Clearly, I am willing to suffer for Jesus. – when my mother was hospitalized for three months with a life-threatening infection, and my amputee father lived with us. All of that happened while I was writing It’s All Under Control. During those trying months, I repeatedly found myself with my head in my hands, praying this prayer: Jesus take the wheel. Yep, I needed the message of the book. Turns out, you needed it too. Does it ever feel like the chaos in your life might break you? Have you ever cried so hard over your circumstances that you thought you might run yourself out of tears? So much of life can feel out of control, and if you’re like me you end up feeling powerless. Looking back, sometimes you can see where things got off track. Other times, the trouble comes out of the blue. You did all the right things, yet the worst news came your way. The tumor growing in unseen places. What people think about us. But can I tell you a secret? We have more control than we think. We are not powerless. Great freedom comes when we let go of what we can’t control, and rise up to take charge of what we can. 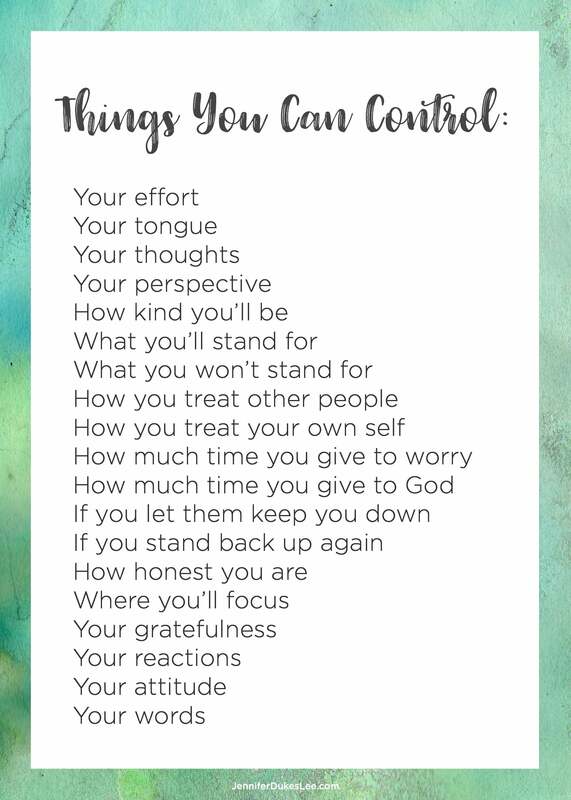 That’s why I’ve put together this list for you, “Things You Can Control.”Click here to download the print. Then frame it, tape it to your refrigerator, set it by your computer, or slip it in your journal. Because of God at work in you, you have more power than you dared imagine. Of course, there are so many things that we can’t control. God can handle those for you. 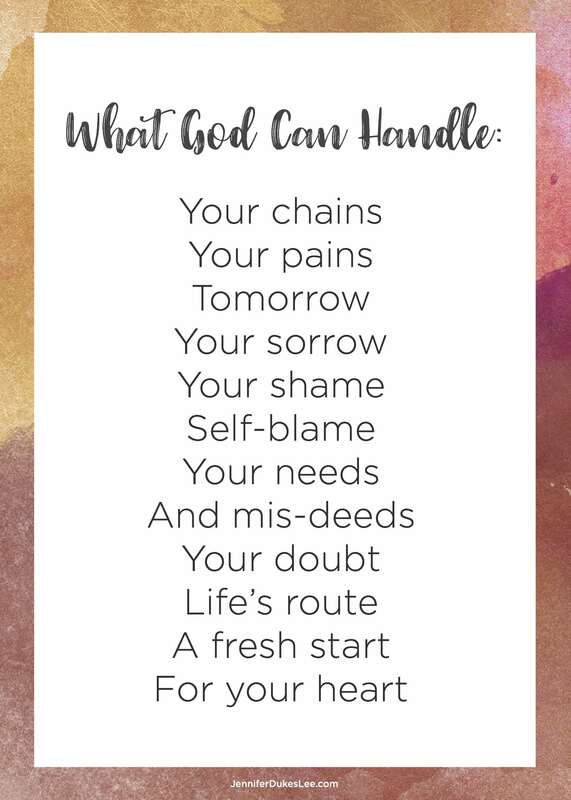 Click here to download and print this list, “What God Can Handle,” as a reminder that no matter what we can’t handle, God still can. To hear more from Jennifer on my podcast, listen here! 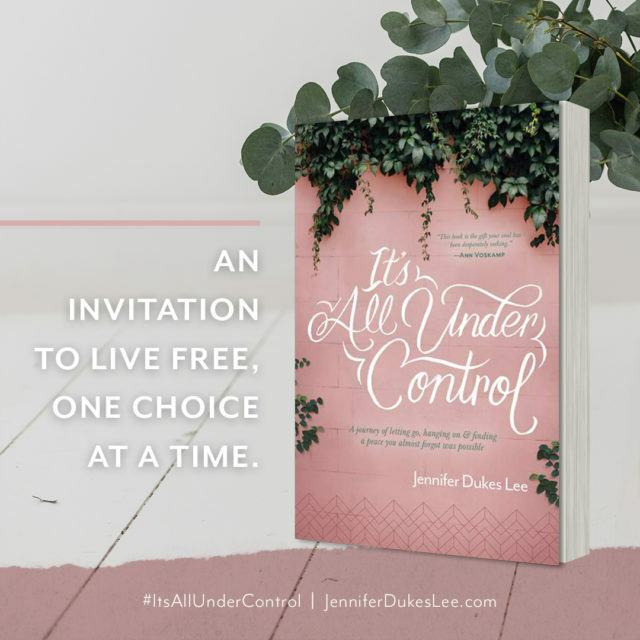 Jennifer Dukes Lee is the author of the forthcoming book, It’s All Under Control. In the book, now available for preorder, Jennifer walks you through a journey of letting go, hanging on and finding a peace you almost forgot was possible. THE BUSY TO BEST CHALLENGE: Are you tired of the tyranny of being “crazy busy?” Join Jennifer for her Busy to Best Challenge, happening in churches, homes and coffee shops across the country September 24-October 1. Click here for details. Suffering. There is something revealing about it. Something about visceral pain that says to the inner man, “Wake up and pay attention!” Something about feeling helpless in a waiting room that makes you realize how helpless you were before you ever got there. We don’t ask to suffer, but it comes anyway—and when it does, you discover *for real* what you are made of and who you trust. We pray. We sing. We trust—we hope—and we wait. Wait for an answer that will help us make sense of what seems senseless. Wait for the next MRI, wait for a glimpse of what God is asking of us. Wait for clear direction. Oh, the wait is excruciating. This is a hard, hard road. Last night, as I cried with one of my sisters on the phone, it occurred to me that I need to look beyond where Bobby is and begin to look at where my family is. There is so much more to the story than what social media can tell. Isn’t that always the case? We are a large family… and we’ve been through a lot. We love each other fiercely. But honestly? I’ve never seen my family like this. I’ve never seen such love, such unity, such hope. But then, we’ve never been so full of grief before. Like most extended families, ours has struggled. Divorce, faithlessness, heartache. Prodigals. We’ve felt all of it, but nothing has done in our hearts what Bobby’s injury is doing. Nothing has come close. 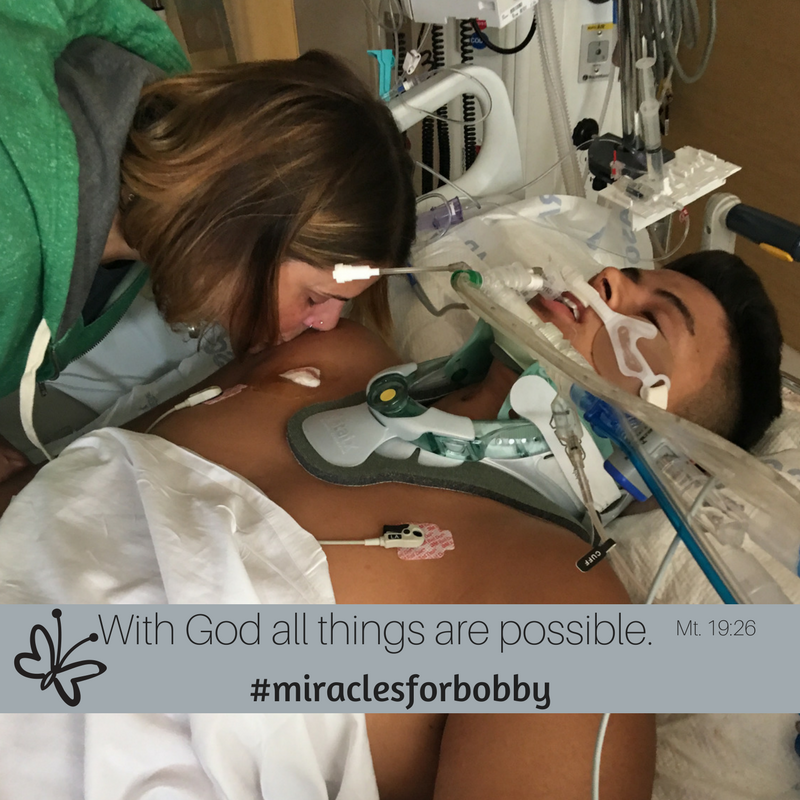 God is using Bobby’s suffering to bring a supernatural healing, one that is being forged in the fires of suffering. While we wait for Bobby’s healing, I give God thanks for getting our attention and reminding us of what really matters. Because of Bobby, it’s bubbling to the surface in our family, in our community and in the larger body of Christ. We trust in the goodness of God and know that He is working, even now. Not only is He healing Bobby, he is healing us. That’s part of the miracle. While we wait the next step with Bobby, we will keep walking this out together. For that, I am grateful. I am grateful for the outpouring of prayer and love that is being shown to my family. I’m thankful that because of Christ, we do not fear death. 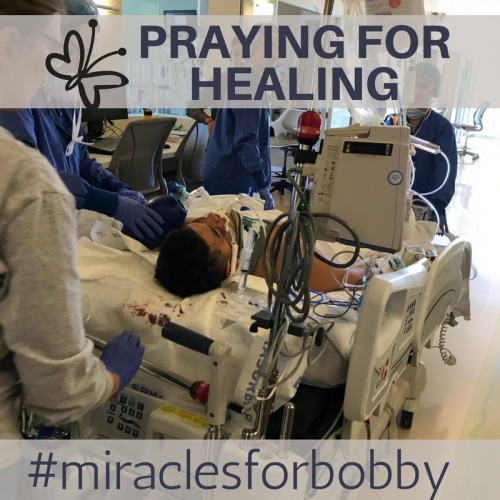 I’m thankful to know that God is capable of performing heart surgery (you know, the soul kind) even while is holding and healing Bobby. I’m thankful for you, Jesus. We praise you in this storm. Thank you that You’re fighting on our behalf. Thank you for the miracles we are already seeing—and ones we have yet to see. It’s 3:35 pm, and after a day of setbacks and frustrations, I finally opened my Bible to write today’s passage. James 1:5 is all about asking God for wisdom. Wisdom, I think, was telling me to ask God for His help at 6am instead of 2:30 p.m. today. Have you noticed how hard the devil works to keep God’s people from becoming students of the Word? I have. I think it’s by design. I think the devil knows that a Christian who isn’t in the Word is weak. I think satan is smarter than I give him credit for most of the time. I can only speak for my own “quiet time,” but I have a feeling I’m not alone when I say that every day, I fight with the enemy of my soul for time alone with the One who made me. I fight my flesh to spend time in the Bible. I go to war just to prioritize prayer over parenting. There’s always something that disguises itself as being more important. Laundry calls. Kids argue. Phone rings. To-do list presses harder. “I don’t ‘need’ to read the Bible today,” I lie to myself. And so, after a compulsory prayer, I turn my attention to more important, more urgent matters. School. Social media. Housework. Bills. Oil change. Grocery store. Meal prep. Bedtime. Start again tomorrow. After days of this, (sometimes months… if I’m really honest), I notice my ability to discern good from evil has been compromised. Little by little, my spiritual eyes grow dim. >>Maybe God doesn’t really care about this and that. Less controversy, please. More peace.<< Yes. Peace is what I want most. The demands of a culture that stands in stark opposition to what God says is right makes even the most seasoned warrior prone to discouragement, I tell myself—as I glance in the direction of my Bible. 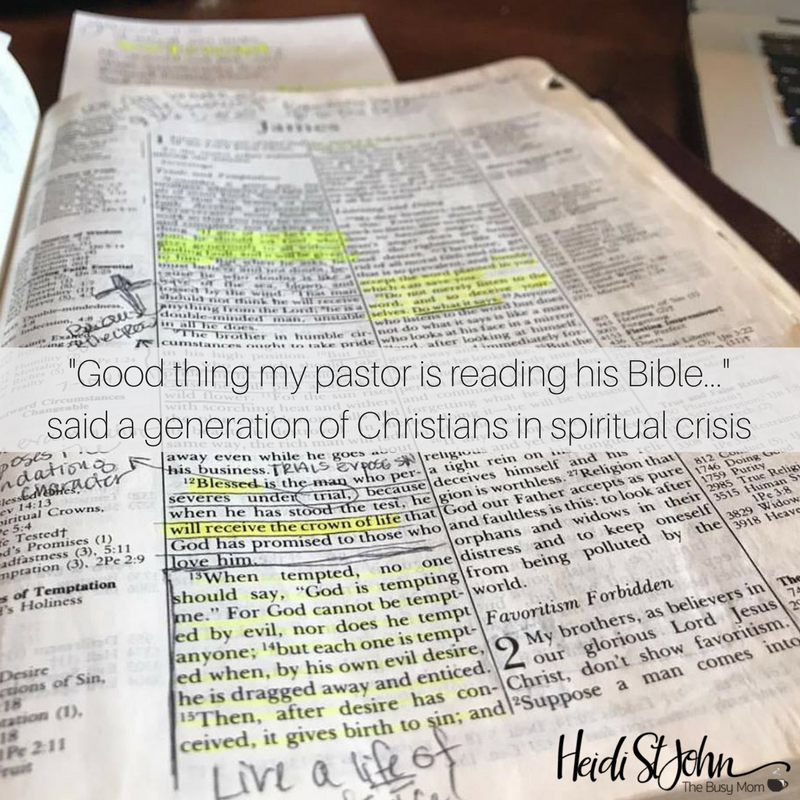 “Good thing my pastor is reading his Bible so he can tell me what I need to know on Sunday,” said a generation of Christians in crisis. This life can be so hard. I remember sitting with a precious woman who had a 2nd trimester abortion in 1974. We cried together as she shared about her ongoing battle with grief and regret. She still grieves for her baby—and for all the babies who have been horrendously taken from the safety of their mother’s wombs since Roe v. Wade legalized abortion in 1973. As she walks out her story, she is finding hope, healing, and forgiveness—but still. It hurts. Long after the abortion, memories linger. Like all of us who struggle with the consequences of sinful choices, the temptation to suffer in silence is great. Satan whispers, “You are beyond God’s reach.” Don’t believe it. Nothing is beyond His reach. God wants your life to sing of His faithfulness and redemption. Redeemed people allow their souls to breathe in God’s inner healing and allow His spirit meets us in the midst of our pain. I remember another night, Jay and I had dinner with a dear couple who were nearing the end of watching their precious father succumb to Alzheimer’s. Tears flowed as we prayed for God’s peace to flood their hearts and home. That same evening, I received the news that an amazing young husband had lost his battle with brain cancer. Even in their suffering, his family shared their story. They wrote on Facebook about what it’s like to feel God’s presence in ways they never dreamed. Reading their story reminded me again that this world is not our home. It encouraged me to keep walking. Keep praying. Keep trusting. Trusting God when things are going well is one thing—trusting Him when things are hard is another. As a woman who has experienced great suffering, I can tell you that my suffering has become my sermon. Why? Because like the people whose stories I shared briefly about here, I have learned that God uses even, no—especially in suffering to bring about His purposes. No one can minister to a woman who is considering abortion like a woman who lives with the regret of choosing one herself. I can’t touch the heart of that mom who is losing her husband to cancer like a woman who has walked that road and found God in the midst of her suffering. The woman who has been abused knows how to intercede for a victim of abuse in a significant way. There is power in the testimony of those who walk through suffering and use it to bring glory to the One who holds all things in His hands. We may not be immune to suffering, but we do not need to fear it, either. nor pay us back in full for our wrongs. As high as heaven is over the earth, so strong is His love for those who fear Him. That’s our God. He does not waste anything. No bad decision, no illness, no suffering. He uses it all. 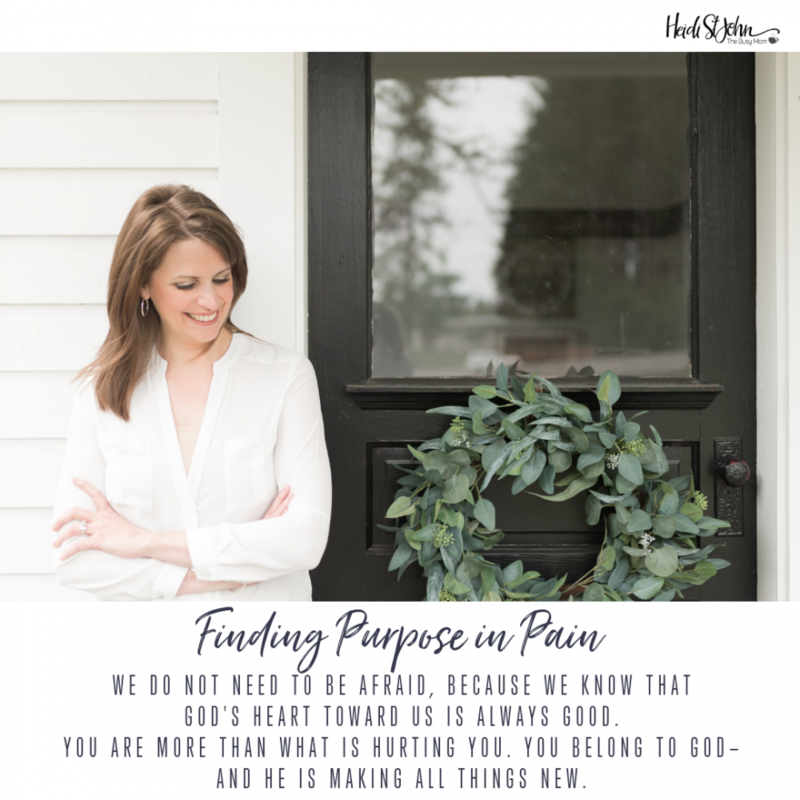 Your pain has a purpose. It is to glorify God. I promise you—when I sit with a woman who is crippled by anxiety and plagued by nightmares from her past, God is getting glory. Why? Because I found God in the midst of my own struggle. He was there—and His redemptive work in my life has become my life-song. Does this make our suffering easy? No. But knowing that God is at work behind the scenes brings purpose to pain. God will use whatever He wants to show off His glory: heaven and earth. Nations and presidents. Broken people. Broken people? Hey wait! That’s me! It makes my heart come alive with hope to know that God wants to use even my pain and struggle. On the days when you don’t have the strength to fight, remember this: God is at work. You’re beautiful to the One who made you. You were made to sing a song of the redeemed. You are more than what is hurting you. You belong to God—and He is making all things new. Does Prayer Really Change Things? I’ve been taking so many things to the Lord in prayer lately. Dreams of a homeschool resource center near our home. Concerns over the future of our country. Elections that will determine the course of a nation for generations. Maybe it’s the fact that I have a five-year old and two grandsons, but the way the culture is heading has me concerned for their futures, too. The obvious spiritual decline in our churches and moral decay of the culture have become a point of regular conversation between me and God in recent months. More prayer. By the way, it’s worth noting that my prayers are not always so high-minded. I routinely ask God to help me with the laundry, too. It’s easy to lose sight of the eternal significance that is found in the oh-so-daily tasks of life when bigger things that are totally out of my control feel, somehow, more pressing. Dishes, laundry, clean up, prepare meals, repeat. Pray again. Begin again. Perhaps you know what I mean. This morning, I had a chance to steal a rare moment of quiet in our busy household. I took it—opening up my bedroom windows to better appreciate the sound of the rain as it hit the roof and cascaded into the gutters. 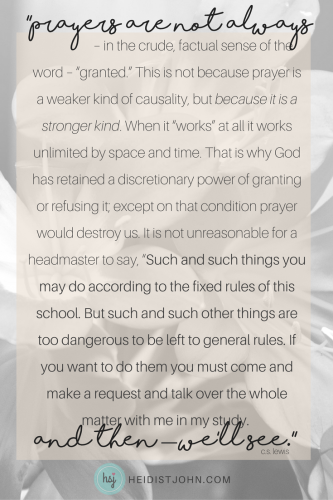 Even if I grant your point and admit that answers to prayer are theoretically possible, I shall still think they are infinitely improbable. I don’t think it at all likely that God requires the ill-informed (and contradictory) advice of us humans as to how to run the world. If He is all-wise, as you say He is, doesn’t He know already what is best? And if He is all-good, won’t He do it whether we pray or not? The argument Lewis makes in his essay is powerful. He asserts that while God could predetermine every aspect of our lives, and while He certainly does not need our help … He chooses to let us have access to Him through prayer. Praying to our Creator offers “small creatures” like myself the dignity of being able to contribute to the course of events around us. In other words: through prayer, we are able to modify the course of history. We can sway the course of events around us through our prayers. Isn’t it amazing? We are heard by the One who made us every time we call His name. 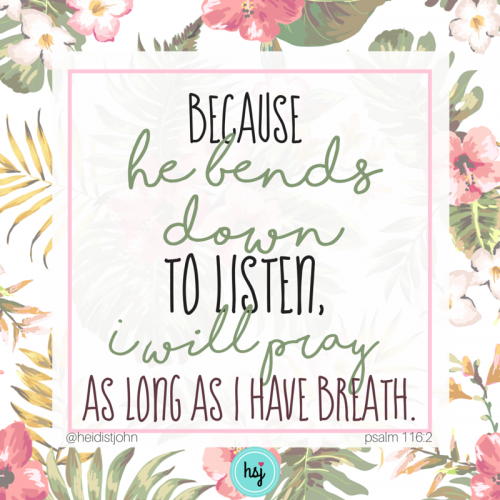 If we’re concerned enough to bring it to Him, the Bible says He bends down to listen. Do you want to change the course of human history? 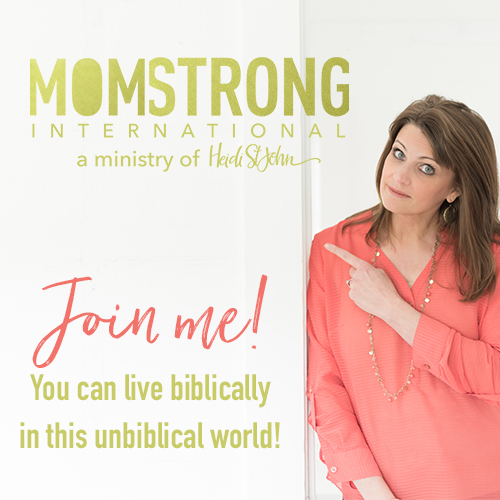 Do you want to see revival and healing and miracles … and run your laundry through with a smile? Take C.S. Lewis’ advice and meet Him in His study. Take it to the Lord in prayer. Are you hiding behind a curtain? Do you notice how many moms hide behind a curtain these days? It’s easy to feel inadequate when the images we see on magazines and online show only happy kids and smiling moms. The reality of course, is much different than the facade. Even though my experience may not be exactly like yours, my hunch is that our stories are not all that different. Women have been hiding behind different kinds of curtains for generations. The image of the perfect housewife from the 40’s and 50’s was a facade that often covered alcohol abuse and infidelity. The 60’s and 70’s saw the culture plummeting from legalism to liberty in a no holds barred attempt to gain a false sense of self and freedom. We burned our bras and gave “free” love away, only to end up disillusioned. Solomon was right. Truly there is “nothing new under the sun.” The fact that we hide is not new, but the things we hide behind surely are. In 2017, we’re hiding behind a screen. The Internet is like a giant curtain, and in front of it, everyone’s an expert. Brad Paisley summed it up perfectly in his song, I’m So Much Cooler Online, a song about a young boy who was pretending to the someone else online. As a blogger, I have seen this reality up-close and personal, as many wives and mothers I meet struggle in their search for significance amid a growing sea of voices. “Platform” is what’s coveted now, and many mothers are losing their families in order to find it. The Internet, as it turns out, is a great place to hide in plain sight. Authentic living doesn’t need a platform, it IS the platform. 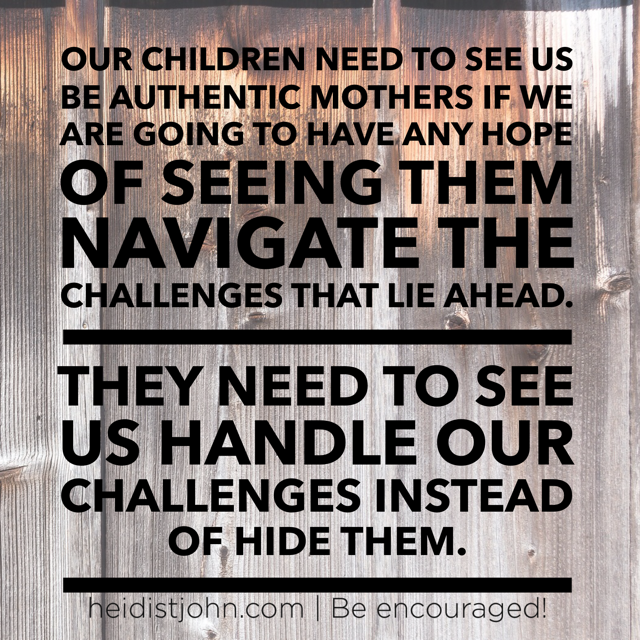 Our children need us to be authentic mothers if we are going to have any hope of seeing our them navigate the challenges that lie ahead. They need to see how we handle our challenges instead of how we hide them. They need to see us walk through them instead of stoically standing and pretending that everything is okay. And most importantly, they need to see us run to the Lord and ask Him for courage to share our struggles with others so they can walk our hard roads with us. Are you ready to be authentic? A couple weeks ago, my heart broke as a woman who claims the name of the Lord Jesus invited her followers on social media not to “overburden” their conscience by hesitating to vote for a pro-abortion candidate. 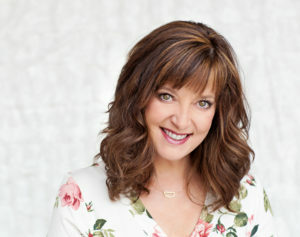 Through her blog, she went on to give a defense of her opinion that was utterly devoid of any evidence of Biblical truth, stating that abortion is a “debatable” topic and that government should make decisions on behalf of women and families. Debatable? Not according to God. Not when it comes to the murder of unborn babies. We can talk all day about what the role of government should be in the lives of the we, the governed, but abortion is another animal. Men and women, if you love God and know that you are going to stand before Him someday, your conscience should be terribly burdened by what is happening to our unborn in the name of “choice.” Anyone who suggests that God doesn’t care about it is not listening to the Lord—or cannot listen because they do not know Him. 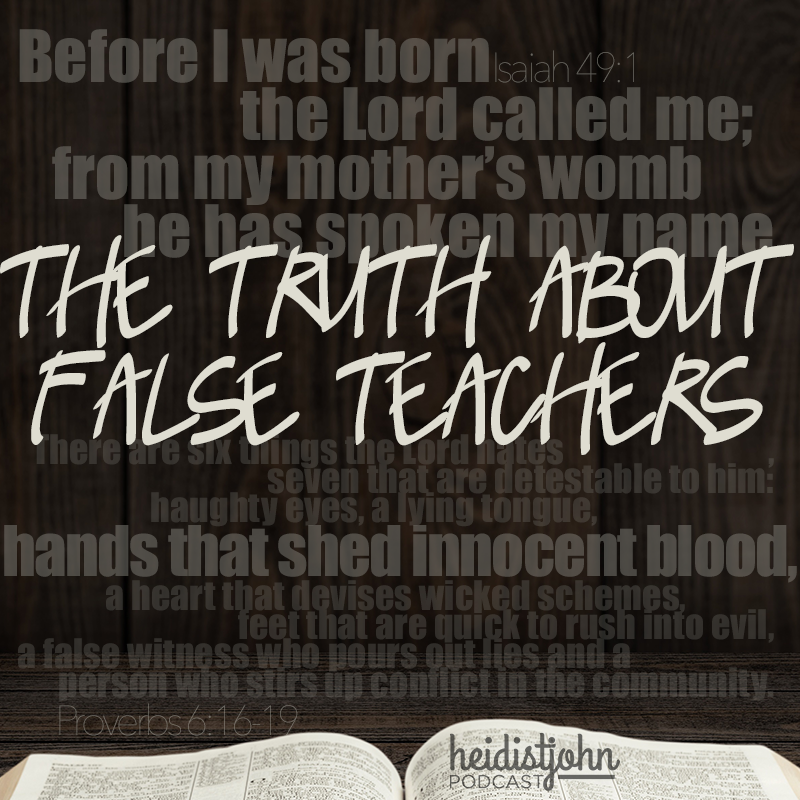 God’s Word warns us against false teachers. If there was ever a time to be on the lookout for them, the time is now. We are living in a generation of biblically illiterate, immature Christians—people who, while claiming the name of Jesus, and wanting His mercy, forgiveness and salvation, do not wish to carry His cross. This was evidenced by the thousands of people who cheered her post and encouraged her in her deception. These people are easy targets for wolves among the sheep, and they are blogging, pastoring and counseling God’s children away from, not into, what God says is truth. haughty eyes, a lying tongue,hands that shed innocent blood, a heart that devises wicked schemes,feet that are quick to rush into evil, a false witness who pours out lies and a person who stirs up conflict in the community. Before I was born the Lord called me;from my mother’s womb he has spoken my name. Every baby whose life has been snuffed out at the hands of another human being belonged to God. Are we so foolish as to believe He will not exact wrath and pour out His righteous anger over us for NOT “overburdening” our conscience? God forms us in our mother’s womb and has spoken our names before we took a single breath. Oh, how we have sinned against the Lord in this nation by calling evil “choice” and excusing sin for the sake of convenience. False teachers promise peace when God says there will be judgment—and teachers who suggest otherwise are wolves in sheep’s clothing. False teachers tell you that you can live in sin and that God will not discipline you. These are all false teachings. Get in your Bible, Christian! Know the Word of God. Don’t be fooled by false teachers. In the end, we will stand before the Lord and give an account for the way we lived our lives. I, for one, am willing to carry the burden of the unborn on my conscience until the Lord comes and makes it right. As believers in Christ and in His gospel, we have no choice in this matter. Click here for a companion podcast!